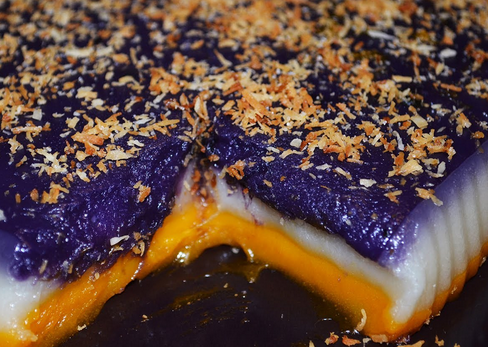 This Filipino rice cake is famous for its 3-colored layers that satisfies any taste bud. Start your own business out of this recipe below. <>Judging from its layered form in three different colors (and flavors! 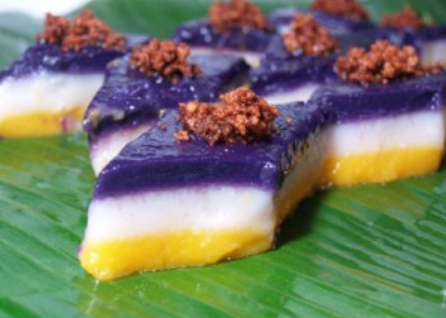 ), sapin-sapin is an appetizing Filipino delicacy that's worth eating. Its name was derived from its English translation meaning ‘layer by layer'. Originated from Abra, this 3-in-1 rice cake has made its way to become famous in all parts of the country and has been one of the Filipino favorites. It is usually served as merienda in most households and in Filipino gatherings like fiesta. Most people have thought of this to be difficult to make, but actually it isn't. This quick and easy recipe will make you want to do your own and sell it for profit. Try this for your startup food business. 1. Combine the glutinous rice flour, rice flour, coconut milk, condensed milk, and sugar in a mixing bowl. 2. Equally divide the mixture into three and put it in three separate bowls. 3. In the first bowl, pour the macapuno and mix well. 4. In the second bowl, combine the anise extract and annatto powder. Mix well. 5. In the third bowl, add the purple yam and mix well. Set aside. 6. Grease the pan and slowly pour the first mixture (macapuno). Cover it with cheesecloth and steam for 10-20 minutes until it becomes firm. 7. Pour the second mixture (anise extract and annatto powder) to the first layer. Steam for another 10-20 minutes. 8. Add the third mixture (purple yam) to the second layer. Steam for about 10-20 minutes. 9. When it is fully cooked, top it off with latik (toasted coconut milk crumbs). 10. Cut into small pieces and serve.